I am a geophysical volcanologist at the Camborne School of Mines, University of Exeter (the beautiful, beach-side Cornwall campus). My research interests are in the processes controlling the dynamics of active and restless volcanoes and the geophysical signals they produce, with an overarching aim of helping to improve eruption forecasting capabilities. Happy times! 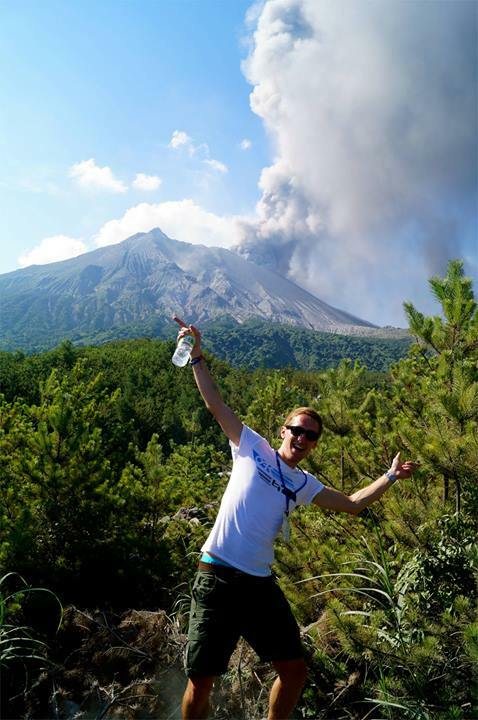 Me witnessing an eruption of Sakurajima volcano in 2013. I have a school student friendly profile page from when I took part in “I’m a Scientist, Get Me Out Of Here!” – you can check it out here. When I’m not working, I like to keep active in my spare time. I can often be found playing hockey, running, cycling, swimming, bouldering, in the gym, or dabbling in some touch rugby. I also try to spend as much time as possible outside – this often takes me hiking, camping, skiing, surfing, paddleboarding, kayaking or otherwise.